Most drunken thanksgiving memories are not really my own. These happened years ago when I was still drinking, though it was my style to stay just sober enough to pull the meal together and – my least favorite part to this day – divvy up the leftovers, which requires concentration and math. Number of guests + lids that actually fit x who wants to take home sauerkraut anyway, hmm? = I have to do this all over again with leftover pie? After the last ill-fitting lid was mashed on, all bets were off. This wasn’t just thanksgiving but any event where respectable, caring eyes were upon me. There was the new year’s eve party where I stayed to help clean up and clanked my teeth against the heavy lip of a champagne bottle because it was well past the point of propriety and stemware. There was the time I snuck off to drink in a quiet alcove in my grandmother’s basement after the crowd thinned from her 80th birthday party. Or what about my wedding day, where there’s a picture of me (somewhere) gulping a beer away from fussy relatives and coworkers I barely knew, but not stealthy photographers. Much of my sneaking around was simply saving face, though there was also thrill in waiting to really get my drunk on. Delayed gratification, holding onto control and then letting go. In the later years, I waited less and less or not at all. Any illusion of control slipped away. The thing about secretive drinking is it packs in the same amount of alcohol a more open drunk might spread out over five or six hours. It comes with the same wicked hangovers and a side of shame you can’t acknowledge, let alone purge. It is scary and weird is what I’m now realizing. I don’t miss it. This will be my third sober thanksgiving and I welcome whatever it brings. If this is your first sober holiday (or second or tenth), please read this excellent primer by Running on Sober. I picked up a couple new tips for this year. Sober holidays get easier over time, but the first couple might sting a little, so go easy on yourself and shove pie down your gullet and wash it down with a boat of gravy if you need to. This is a kind of warm and fuzzy war. This year I’m going to make sure I have plenty of Aunt Helen’s punch on hand because let’s be serious — drinking gravy is dangerous if it’s hot and disgusting if it’s not. Plus drinking all the gravy would make for dry leftovers and regrets, and we don’t have to live like that anymore. Combine all ingredients well. Chill. Add extra ginger ale to serve. The only “talent” show I remember being in was in third grade, when me and two friends played the theme song to the Greatest American Superhero on our flutes. The other third graders sat indian-style on the floor and the three of us positioned our chairs in a tight huddle so we could share sheet music and pretend no one else was there. I still have the recording somewhere and it is just as painful as you might imagine, only worse. During recess, the three of us pretended to be cats and dogs having adventures and once we got into a real cat-and-dog fight over something I do not remember now, though I do remember how everyone stared because my face got all red and welty from crying. I’ve never worn emotion well. My youngest was in her first talent show last weekend. She’s in kindergarten, so her act consisted of three 5-year olds narrowly missing each other with a dizzying array of willy nilly half-cartwheels, one-legged jumping and devil-may-care spinning. Each act was limited to two minutes, which is about 30 seconds longer than the average person’s attention span for amateur gymnastics, though you get to add an additional 15 seconds if the kids are cute, and kindergartners are really really cute. During the talent show, I sat through 4 renditions of Katy Perry’s Roar. For the math-impaired, I have a calculator, so sit back and let me handle this. That’s 480 seconds of feel-good earworm, but none moreso than when a 2nd grade girl in a glittery fedora and MJ gloves belted it out and moved me to tears. In addition to weddings and many movies, I also cry at dance recitals and talent shows. The subtle wiping of each eye a half-minute apart is as much a dead giveaway as a red, welty face. This answer didn’t satisfy my girl and she asked me how the 2nd grader practiced and I told her she sang the song over and over again and got better and better at it. Minutes later I heard a tiny little voice singing from the backseat and I smiled and we drove someplace to make things together out of clay that look like they were all made by a kindergartner, which is an insult to kindergartners everywhere. Practice may not make perfect, but it makes almost anything easier. Each day I didn’t drink in the early days made it easier to get through the next day. Each time I go out for a run, it builds muscle and lung for the next run. Writing feels more fluid and fun as I write more. I’m staying away from cartwheels and singing, but with enough practice I bet I could move you to tears of some kind or another. Whatever you want, stick with it. Don’t give up. And here’s one more picture because how often do you get to post a picture of 3/4 of your family on a couch flanked by storm troopers? Not often enough, I say. The return of zen is most likely from the passage of time, though a book a friend recommended helped guide me to stay in the moment in a way that never clicked before. We are ready when we’re ready, I guess. I am a natural worrier, not to be confused with warrior. A warrior wouldn’t worry, would she? So I am trying to practice letting go of everything I can’t do something about in the moment it pops into my head along with a this is unacceptable. It doesn’t always work, but when it does it brings sweet sweet peace. The thing I most enjoy about being present – and mind you, it still feels tentative and like I could simply forget to do it – is how the stillness in the moment somehow makes everything else brighter or sharper. 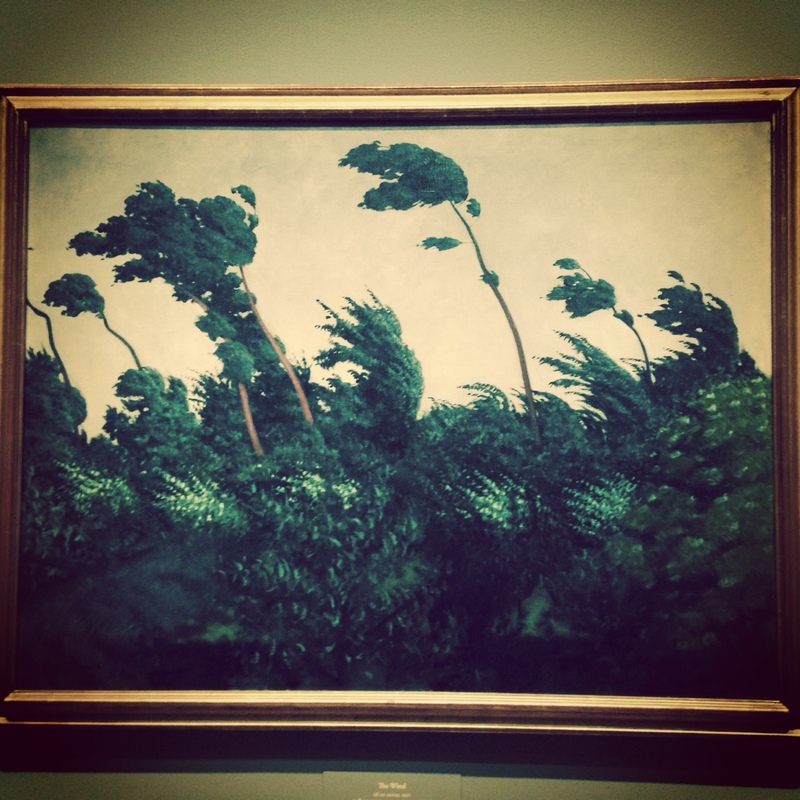 Last weekend we walked through an art museum and I took this picture of some trees and it was the only one I took other than a painting of a renaissance man blowing a bubble through his pipe (because, duh), and later realized what was so appealing about it. When I was a kid, I used to get really excited just before a storm hit. I was the little weirdo standing in the middle of our backyard so I could hear the rustle and see the pale underside of leaves up close. The storm never lasted very long and its destruction was never certain, but the preshow with its fully charged electrons or ions or other sciencey terms was as close to drugs as a 5 year old could get. Now, much older and wiser and terribly afraid of electrocution, I prefer to see the pale underbellies of leaves from inside or, better yet, in paintings with the family. I see trees that get shaken and whipped around and maybe lose branches, but they survive. They weather the storm even when it seems they can’t. At the art museum gift shop, I treated myself to some colored pencils and the same day had a deep discussion with my 5 year-old under a massive canopy of oaks about why acorns get separated from their tops. 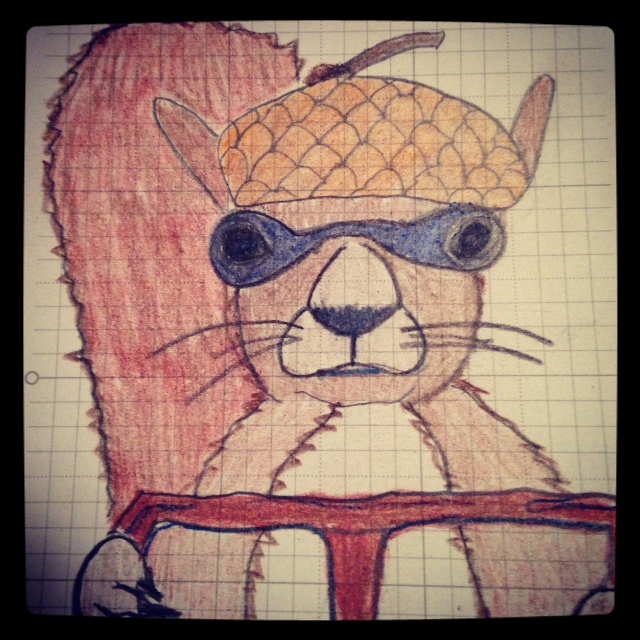 We decided that acorn tops are really bike helmets for squirrels, and nevermind that the scale is all wrong or why are squirrels just dropping helmets willy nilly all over the place (because they’re squirrels!). The fella below rides a bike made of twigs. I’m not sure about the goggles but think he bought them on a tiny version of amazon, which I would totally shop at and I am not even a squirrel. If you get new posts via email, you may have noticed this one was initially set to password protected. You may have noticed you did not have a password and maybe this drove you so crazy you tried random words or your third grade teacher’s name in hopes you could somehow access the wisdom surely contained therein. Or not. Long story short, I used to have another blog many years ago where I didn’t write about sobriety, mainly because I was not sober. Occasionally I did illustrated posts, which I found a lot of fun and challenging on account of the fact that I can’t draw. Recently a friend encouraged me to try my hand at something creative and challenging, and so the not-so-short-afterall story is I thought I was setting this illustrated post to private but instead it went out to subscribers and now I feel obligated to show you it was just me not having a clue how this whole internet thing works. p.s. the password was your fourth grade teacher’s name! If I go into October 10 on my phone calendar, I can see the red shaded box clearly. Okay, I added the exclamation point just now, but it was definitely in there as a reminder. I don’t know why the reminder didn’t remind me like I thought I’d set it up to do. 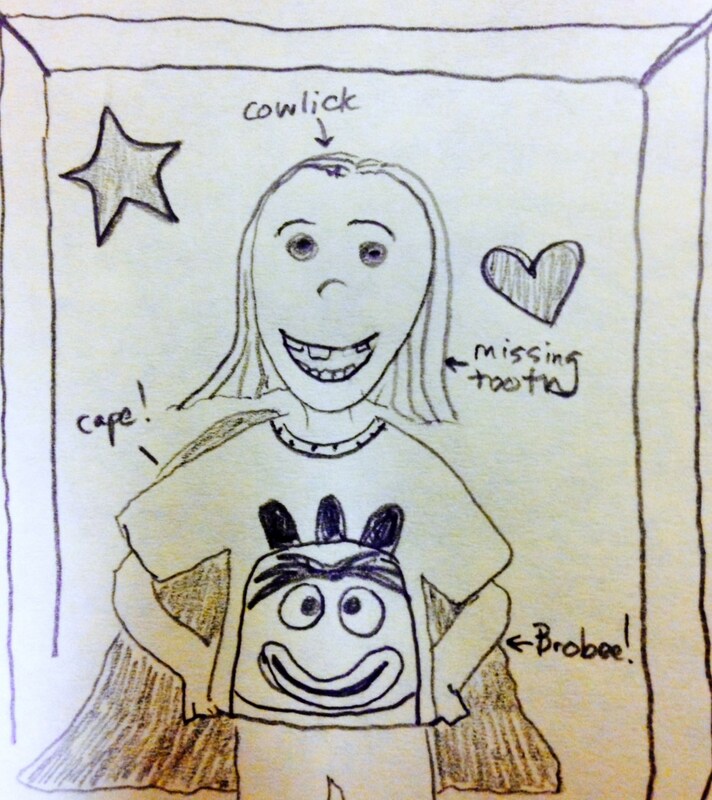 I could blame a lot of things for why I forgot, but the fact is I did forget and I sent little Audrey to school on picture day dressed in a too-small t-shirt with a monbrow’d monster on the front and purple cape on the back. 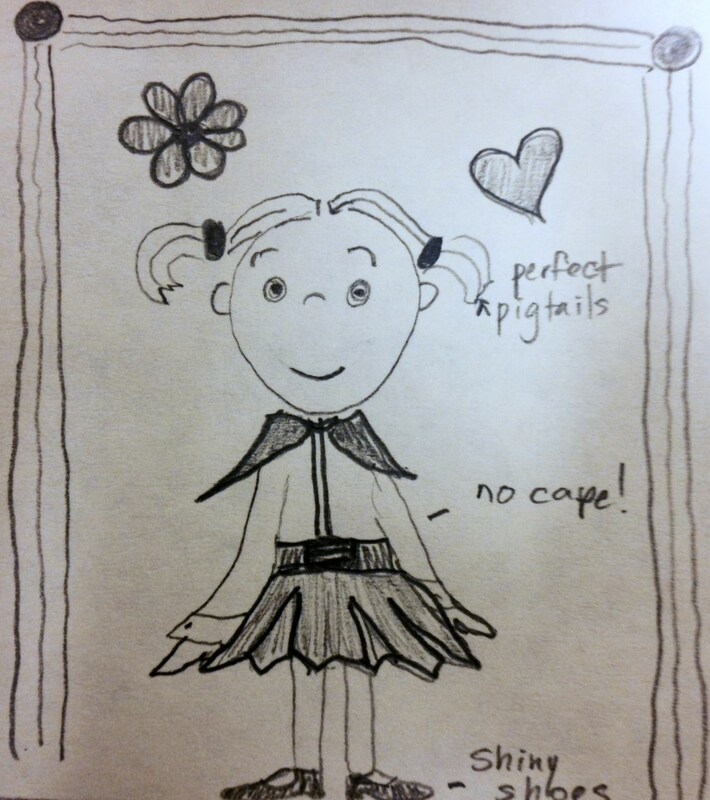 Nevermind that I can’t do pigtails to save my life and that she doesn’t even own a fancy-collared, button-up shirt, but I felt like I’d failed her as a mother. I’d sent her in dressed as that kid on the one day it would be captured in the yearbook, ie forever. We got the pictures back last week and I’ve never seen her look so naturally happy in a photo. Her cowlick is neatly in place along with the rest of her hair. She’s smiling big enough to see the gap where her front tooth will one day come in, though not for awhile. You can see part of the cape and all of the monster’s monobrow and it seems clear that he too is a happy little monster. I don’t think we’ll be needing Make Up Picture Day afterall.